My name is Jessica Miller-Suchet and I am a Neuroscience major graduating with the class of 2019. I am very interested in art history and studying different cultures throughout history. I have always been fascinated by archeology but I have never had the opportunity to study it in this type of hands-on setting. I am excited to be able to learn in such a unique way and discover new things about the mummy portraits and other artifacts. 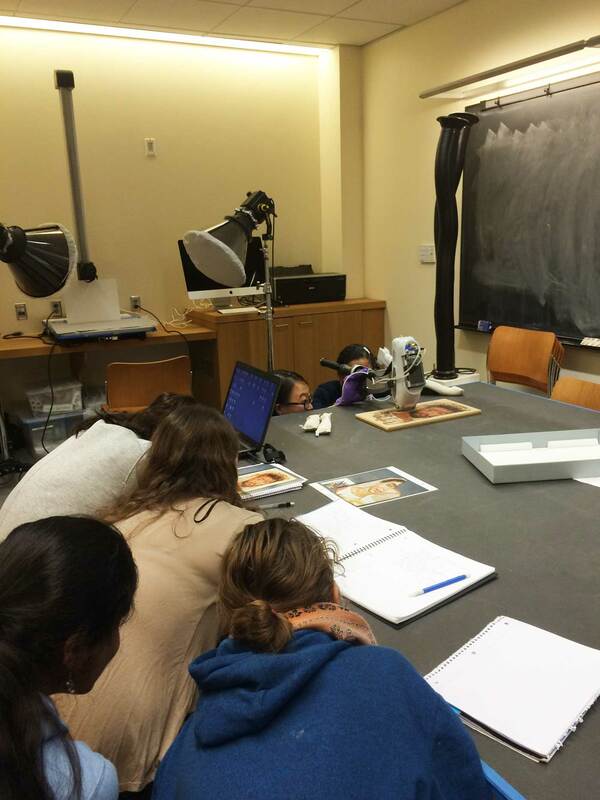 Jane Williams, Head of Collections and Conservation at the Hearst Museum, compares notes with us about our research on the mummy portraits. 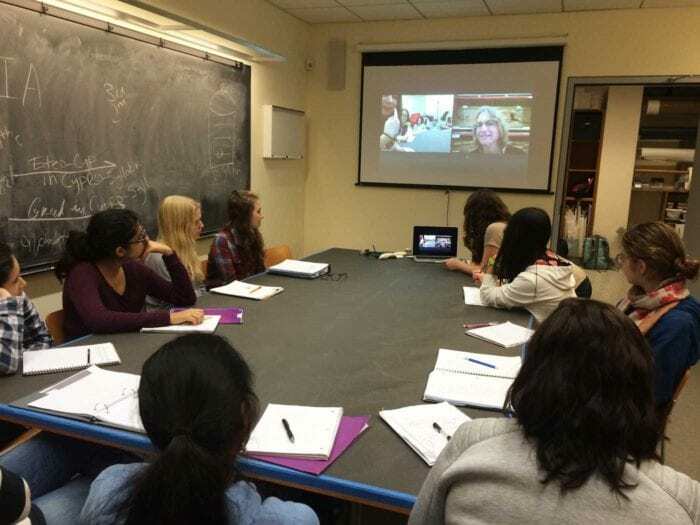 This week, we had the opportunity to speak with Jane Williams, Head of Collections and Conservation at the Phoebe A. Hearst Museum of Anthropology at the University of California, Berkeley. The portraits she discussed were excavated in 1899 by papyrologists Bernard P. Grenfell and Arthur S. Hunt working just outside of the site of Tebtunis in the Fayum. They collected nearly 30,000 papyrus fragments, most of which were found inside the over 1000 crocodile mummies found at the site. In addition to papyri, over 1800 objects were found during excavation, including their collection of Roman Egyptian portraits which are unique in having come directly from the site of excavation to the museum and having never been on the art market. Thus their surfaces, while not necessarily the most pristine, are remarkably free of post-manufacture restorations. Most well published of the portraits is the portrait sketch of a woman which features notes describing how the image should look, what jewelry and colors should be included, and even a comment about how “the eyes should be made softer”. While all of the Tebtunis portraits were found at that site, they show variations in manufacturing and production. Williams described how the portraits at the Hearst were placed into groups for study: the “pink ladies,” who were named for their pink garments, and a group of male portraits. The aim of their current research was to use entirely non-destructive techniques to study the portraits for inclusion in the APPEAR database. The first surprise was the background of the paintings. They were able to find the pigment Egyptian Blue on the portraits of the men through visible induced infrared luminescence imaging, which was confirmed through X-ray fluorescence (XRF) in which they found the element copper in the background. However, the female portraits did not show any Egyptian blue. The “pink ladies” were confirmed as having been painted in encaustic using Fourier Transform Infrared Spectroscopy despite the fact that the paint layer was extremely damaged and thin with very little binder remaining. Limewood was used on the female portraits and one of the male portraits they have studied (as were the paintings of our two men at the Archaeological Museum), while three of the male portraits were completed on thicker oak panels. Even the thickest limewood panels are deformed or bent, where they were placed over the face of the mummy, while the oak panels are much flatter, but prone to splitting. By including a calibration target in Photometric Stereo (similar to Reflectance Transformation Imaging), researchers from the Northwestern University/Art Institute of Chicago Center for Scientific Studies in the Arts (NU-Access) were able to measure the surface texture data to get a sense of what kinds of brushes might have been used. In one area on the background of a male portrait, they consistently got a measurement of about fifty microns for an individual brush hair; this strand diameter is approximately that of a squirrel. It would be interesting to see if our portraits have brush strokes of a similar size! They also found bubbling in areas painted with lead white which they think are a result of the formation of lead soaps. We also found bubbling (with a textile impression) on the proper right cheek of the young man. This bubbling could also be due, in part, to lead soaps. Portable XRF work of the “Portrait of a Man” in progress. We also compared some of our data with the information gathered thus far at the Hearst. Williams noted that they have found white chalky underdrawings—possibly gypsum (calcium sulfate)—on all their portraits, and has been wondering whether this was a local Tebtunis practice. When using XRF, they found the presence of sulfur not only in these areas but all over the portraits. We also have noted the presence of sulfur (and calcium) on our portraits, but had not seen any chalk underdrawings or any gypsum preparatory layer. So what could this sulfur be from? We also discussed the presence of tin in our XRF spectra in areas of jewelry—which is also something that has been noticed on one portrait at the Hearst. What could this be related to? After Williams spoke with us, we completed some XRF work with the “Portrait of a Man”, which yielded similar results to “Portrait of a Young Man”. As this project comes to a close, it’s important for us to be able to bring all of the information that we’ve collected together. Speaking to Williams gave us an opportunity to compare the data that we’ve collected to another set of information about the Fayum mummy portraits. As one of our last meetings about our portraits, I feel that Williams’ presentation was a great end. I loved being able to compare our notes with Williams and collaborate our similar questions. Great article Jess! I can’t wait to hear some of the interesting trends between the portraits that will be brought to light through the APPEAR project. Like you said Jess, even by just doing XRF work we found similarities between our two portraits so it’s incredibly exciting to think of what will happen when we throw a lot more portraits into the mix, who presumably could have a lot more in common with one of our portraits than just our two have with each other! What a nice article to wrap up the blog! Nice job Jess! This semester just slipped away! The XRF confirmed some of our suspects, but also brought up some new questions. It will be very useful to have quantitative elemental analyses of the both portraits as well as having both sides of the portraits examined, so that we can differentiate the influence of the environment and that of the paint itself. There are still a lot that can be done to reveal the mystery of these two males. Even the semester is over, we still look forward to any more discoveries! Wonderful semester with you all! XRF is simultaneously amazing and frustrating. Since it is a qualitative, not quantitative measure of elements in pigments, we were able to find out which elements were present, but not how much of each were. It was great to give us an idea whether or not what we thought was Egyptian blue, was Egyptian blue, where red pigments came from, etc. However, we can’t know for certain if these results are accurate or not. Great article Jess! Good article Jess! I agree with Tess XRF is amazing, frustrating, and also kind of terrifying! Watching the machine get so close to the portrait we have developed such a relationship with our portrait and I don’t want anything else to damage it. Jane Williams was great to talk to and I was proud that I was able to understand all she said about various imaging techniques, a knowledge I did not posses at the beginning of this semester. It was great to see her presentation, I have already seen so much about the Hearst Museum that it was very informative to hear the Head of Collections and Conservation’s presentation. Thank you everyone for a great semester! It was interesting seeing just the similarities between our portraits and the ones at the Hearst Museum. I can’t wait to see how all of the different portraits in the APPEAR database connect to each other as well! Even though we’ve learned a lot about our portraits over the course of the semester, there’s still a lot that we don’t know. I’m excited to see what else is discovered about them. I’ve had a great semester with all of you! Collaboration is definitely the key when trying to understand the many unknowns with these paintings. For that reason, speaking with Jane Williams was definitely a nice way to wrap up and make final conclusions about what was discovered over the course of this semester. It was a great experience and look forward to what others will find about our two portraits. Great article Jess! I thought the note on potential sources for this “stray” sulfur was interesting, as since we were able to XRF the “Portrait of a Young Man”, I had assumed that the sulfur was from gypsum. However, if our observations of the lack of preparatory layer and no jewelry on the “Young Man” are correct, then the sulfur or possible gypsum must be from something else. This only proves to show that ben when we had worked on these amazing paintings all semester and were getting ready to wrap up our findings, these ancient mysteries still have more to tell us. I agree with Anthony, collaboration is key to learning and growing more with these paintings.